Miyamoto, an orphan, a "Returner", a solitary killer for hire. 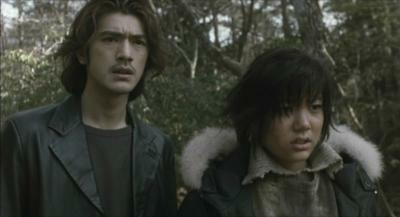 In a mission he comes across Mizoguchi, a big brother in the black market, who killed Miyamoto's childhood best friend. A gun fight starts, Mizoguchi slips away as Miyamoto mistakingly shoots a young girl, Milly, who has come from the future. Fortunately she survives, and gets Miyamoto involved in her mission, a mission which they absolutely must complete in only 2 days, and for one more reason which they don't know of - Mizoguchi. Question. What happens if you take elements of Terminator, The Matrix, Independence Day, Men In Black, Clockstoppers and general triad films? 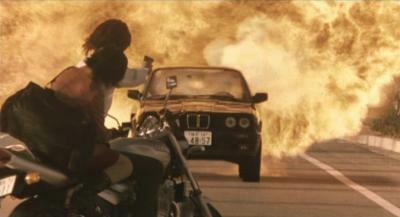 The answer is this new sci-fi action flick from Japan, Returner. Now don't get me wrong, just because elements of the mentioned films can quite clearly be seen in Returner, it does not mean that it is merely a clone of these films. In fact, it definitely is not. Let's put it this way, this is the first sci-fi triad type film I've ever seen, or heard of! They couldn't believe it when they realised the British find Julian Clary funny. The opening scene clearly shows that the people on screen are in serious trouble, and that they are being massacred by something. But no sooner has this been established and the film changes to night time at a pier, where a triad deal is going down. 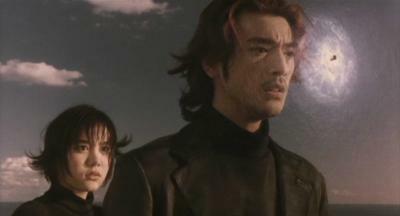 Soon everyone there is killed by Miyamoto (Takeshi Kaneshiro), except for the triad boss Mizoguchi (Goro Kishitani), as he escapes when Miyamoto is distracted by, and shoots, Milly (Anne Suzuki), who quite literally appears from out of the sky. Soon we learn that she is from the future and has come back to change the future and save the human race. However, that is a task she feels she cannot do all by herself, and as such "persuades" Miyamoto to help her. In getting him to help her she explains what has happened to Earth in the future, and how she must kill a certain being to stop it from happening. However, when she is in a situation where she can complete her mission, something is different to what she expected and causes her to doubt the true cause of Earth's future troubles. "When you own a bike, posing next to it is 50% of the job!" So what you've got in Returner are lots of fancy CGI, lots of action, triad gang wars and apocalyptic scenarios, all very stylishly done. But is it a matter of style over substance? Well, in my opinion, the answer is, no, not really. Well maybe... There are moments in the film which are very good, everything about them is well done, yet there are other moments when I found myself cringing as something about the scene or what was going on was very poor. Before I go into that though, I thought I'd justify what I said in my opening question by giving examples of what elements of the films are in Returner. However, as this is likely to have a few minor spoilers, to read it you must highlight the "blank" section below as the text is the same colour as the background colour. Terminator - Person sent back in time to change the future. The Matrix - In style. The look and feel and bullet time scenes. Independence Day - BIG alien ships invading Earth. Triad films - The whole film is really a triad film. 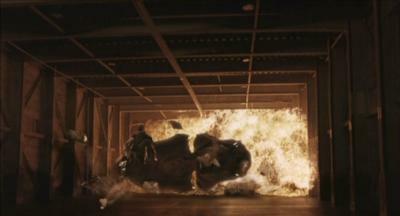 Men In Black - The future's fancy technology, and the stuff we see Milly using in her first scene in Miyamoto's flat. Clockstoppers - The accelerator thing that allows them to move really fast. Ok, so I know some of the links are tenuous, but I don't care!! "I think this lighting makes me look meaner..."
Ok, end of any possible spoilers. Now onto specific comments on the film itself. Good things first. Returner is a pretty good action film, and it is rare to see sci-fi films involving aliens coming from Asian countries, as sci-fi appears to be a genre that isn't really frequently covered in that part of the world. All the action set pieces are very stylishly done. There is plenty of guns being fired, and lots of drone bad guys being killed left, right and centre. Violence! I love it! The plot, while in some places is possibly ridiculous, is still quite interesting. When you think about the scale of the events which are going to happen in the film if Milly fails her mission, it is hard to believe that one person can be responsible for this. A planet of five, six billion people, and virtually all of them could be killed because of the actions of one person. Anyway, this highlights, quite well in my opinion, the serious negative side of human nature - greed. "The car in front, has one hell of a turbo drive!" As I've said, the film is very stylishly produced, making it look like a big budget film, and this works well for many of the action scenes. However, now the not-so-good things about the film. In trying to be very stylish, the film suffered in some places. In some of the action scenes where the two good guys are up against people with guns, we get lots of slow motion shots of them running, about to attack the the bad guys. They do some fancy kick to knock them out, or knock the gun out of their hands. Those scenes where this happens were some of the ridiculous ones. In the time it took for them to run about 25 feet, do a jumping front somersault and then kick the people with automatic machine guns, those people with the guns, despite already having them pointing in Miyamoto and Milly's general direction, could not fire off a single shot. For a lot of the film you are quite happy to suspend belief of what is going on and just enjoy the ride, but this just makes it look stupid. Another crap thing about the film is the acting and speech delivery from the english speaking people in the future. I know white folk aren't the main people in Asian films, but surely they could find ones who could act better than those people. The final criticism I have is that some of the CG effects weren't that convincing. Maybe it is the lack of budget for this film compared to your typical Hollywood CG orientated film, but some of the computer graphics showed that Asia is still quite a bit behind Hollywood in that department. "It wasn't a swimming pool, but she still tried a triple tuck twist!" 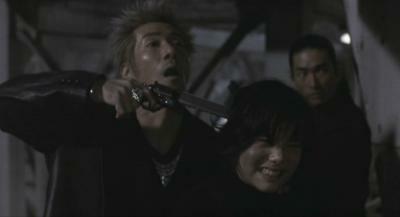 Anyway, Returner on the whole is a decent action film. Not brilliant but there are enough good points in it to overshadow the negative and completely unbelievable side of it. 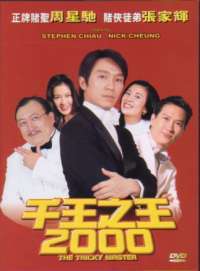 There are three audio options for the film, Cantonese stereo, or Japanese in Dolby Digital 5.1 or DTS. I went for the Japanese DTS option, and the film sounded good! The surround speakers were used suitably when aircraft were flying from behind the camera to infront of it, bullets flew around all the speakers, and there was nice bass in the explosions! The speech was clear and crisp, and really there is nothing there which I can really complain about. "I'm bad, and you know I am..."
The subtitles were just as good as the audio. With literally one or two exceptions, there were no noticable spelling or grammer errors, and the white font used was perfectly clear and legible at all times. The english speech, however, was subtitled, and in one instance the subtitles did have the wrong word written compared to what was said. If I remember right, the subs read "filled" while the person clearly said "field". Ok, maybe to a native english speaker it was clear that it was "field", but to a non-native english speaker, it might not have been so clear. Anway, that fault aside, I can't remember anything else negative about the subs. Being a very recent film, I would have expected nothing but a very good transfer for the DVD. This is what almost has been delivered. 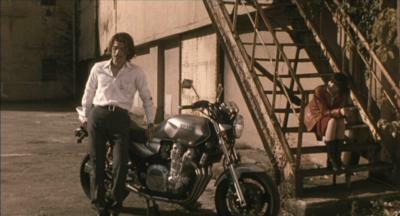 The film is presented in 16x9 anamorphic widescreen, and was dirt and blemish free for the entirety of its duration. However, the colours I don't think are as well defined as they could have been. Some of the shadow tone doesn't appear to really be there, and the print as a whole I think could have done with being a little brighter and bolder. I found I had to turn my light in my room down to make the screen clearer. Comparing to the likes of the colour reproduction in Hero, this transfer can't even compete in those stakes. Maybe this fading of the print and the more bleak colours, rather than bright bold ones, was a deliberate choice of the director's, to reinforce with the rather bleak plot. I don't know. "And miraculously, I didn't spill a drop!" 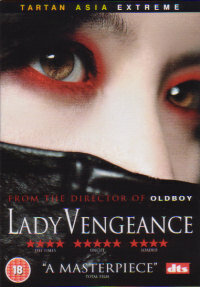 The dvd comes with a decent enough cover to the box, featuring a heavily Matrix stylised pose from Takeshi Kaneshiro. The dvd itself has a static menu, and a small selection of extras. There are Star Files on the three main performers and the director, interviews with Anne Suzuki, Takeshi Kaneshiro and director Takashi Yamazaki, a Making Of... featurette and lastly a trailer for the film. Best of all, they are all subtitled in english!!! That last comment deserves three exclamation marks as it is not often that extras are subtitled in english on Hong Kong dvds (that I am aware of), so feel honoured! Anyway, I watched most of the interview with Takeshi Kaneshiro hoping for something really interesting, but alas it was not. He certainly didn't come across as interesting or as charasmatic as some of the characters he has played in films! 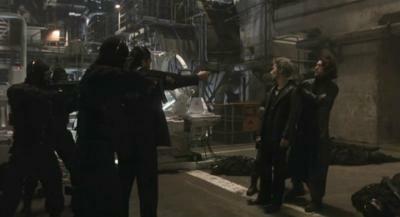 The making of isn't as good as it could have been either, as it is just you seeing different scenes being filmed. Nothing about the CG effects or anything else, just them shooting scene after scene, and unfortunately most of the scenes which you seem them shooting are not the action scenes, it is mainly just scenes which involve people running. That's it! Anyway, at least there is something, so maybe I shouldn't complain too much! "Four of you, one of me! Ha! You don't stand a chance!" What I will complain about though is that towards the end of the film, it did pause slightly on a couple of occassions. It was kind of like the pause you get with the layer change, but as that had already happened, it couldn't have been that again! Why it briefly paused on those couple of occassions I have no idea, and I don't even know if it is just my disc it happens to, or a whole batch of them. Either way it is noticable, but fortunately not that distracting. Those extra hours of telekinesis training finally paid off! 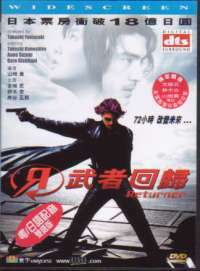 In conclusion, Returner is a not bad action film. It is different enough to virtually every other Asian action film, which I know of, to make it well worth a look. It is a stylish, no-brainer, violent, popcorn action flick which is great just to put your feet up and enjoy the ride with. It is a shame that there are some really unbelievable and ridiculous parts to the film, but nonetheless, I think it is worth a look.